Fading dark weft jeans can be a mystery. With a standard indigo warp and white weft you have a pretty good idea of how they’re going to turn out, but throw some black or indigo on the inside and sometimes even the makers themselves don’t know what’s going to happen. 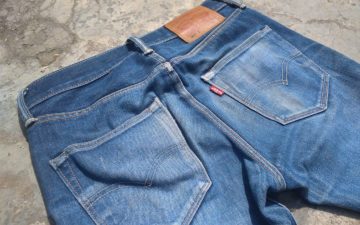 This week’s Fade Friday is one such jean from Los Angeles based brand Rogue Territory. The Dark Stantons feature 13.5 ounce over dyed indigo warp by over dyed black weft denim from Japan’s Kurabo Mills. The heavy amount of dye made many wonder how the jeans would fade or if they would even fade at all. After 9 months of continuous wear, Rogue loyal customer Long Yau proved that they do indeed fade and they do it beautifully. Check out Long’s photos of the wear on his jeans as well as his 3 month old Rogue Territory Supply Jacket below.